I think most of us are pretty fed up with the state of British politics at the moment, done with being spoon-fed the latest sugar-coated sound-bytes by people who are so out of touch with the British way of life it’s embarrassing. 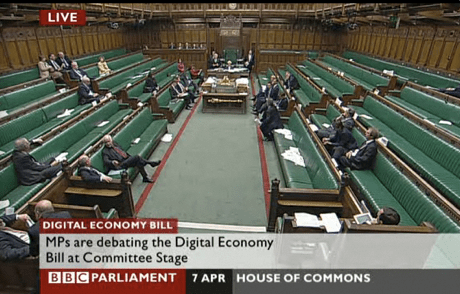 However, on Wednesday night the Digital Economy bill was rushed through as Labour and the Tories proved yet again that they actually represent the big businesses who fund their election campaigns rather than the people that elect them. Anyone with a short memory might need reminding of Peter Mandelson’s meeting with Geffen last year. The DEB is an extensive and controversial piece of legislation, was rushed in by a vote of 189 to 47. The legislation encompasses online copyright infringement, internet piracy, regulation of TV and radio, the classification of video games, regulations over ISPs, and a whole host of other digital topics. The most common mistake people make when looking at this law is “It’s just about the net and illegal downloading”. This is not the case and a quick look at clause 41 tells us that gamers are in for a rocky ride. #41: Extends game regulation under Video Recordings Act 1984 to games that include violence to humans or animals, encouragement of criminality, drug use, encouragement of alcohol or tobacco use, sexual messages, swearing, and offence. When watching the recent witch hunt on gamers on the Alan Titchmarsh show, and this latest move by politician’s, it’s not hard to see why a large number of the British population do not feel like they are living in a democracy but our future seems somewhat Orwellian, where laws can be abused to block websites much like the anti-terrorism laws have. Something as vast as this requires huge debate and thought and neither seem to have taken place, especially considering the potential headaches it could cause for things like public Wi-Fi, and the huge increase on the horizon of home networks being hacked. Democracy in action, a few people decide the future for many. Only around twenty MP’s actually debated the bill, the rest just filled in to vote, told by their ‘whips’ which way to go for the greater good. This begs the question; how do laws get passed in a democracy when 64% of those supposed to represent the people don’t show up? The lack of understanding was made clear when Stephen Timms, the Labour government’s Finance Minister said, that people could simply password protect their Wi-Fi. It is surprisingly quite easy to hack even secure wireless networks and change your Mac address, so how long until a silver surfing granny is on the headlines of the Daily Mail because she has been accused by the government of downloading Scooters Greatest hits? Clause #10: The govt. can tell Ofcom whether it should order ISPs to sanction speed blocks, bandwidth shaping, site blocking, account suspension or other limits against an ISP customer. First, Ofcom must do consultation and consider whether these measures would work. Regarding the downloading of music, it widely known that people who download music are the people that actually go on to buy more music. As Billy Bragg suggested recently, “the record industry is in trouble,” he said, “but the music industry is thriving”. The BPI may have shot themselves in the foot as more people turn to music on demand services like Spotify, so they no longer require a hard drive full of songs. Clause 8 of the bill also seems to suggest that we could see websites such as Wiki Answers, which contain copyrighted material, blocked. Even a site like ours could in theory be blocked by displaying a copyrighted game trailer or picture, which in effect brings legalised censorship to these shores. The old days of being spoon-fed information by the mainstream media are slowly changing. Newspaper sales continue to decline as people turn to the internet for the latest information, and the establishment need to realise that the eighties have gone and the old business models no longer work. Despite this law being rushed in with no newspaper headlines informing the public on Thursday morning, the number one trend on Twitter is the Digital Economy Bill, which is refreshing to see that no matter how hard they try to stop stories from circulating; the word is spread far and wide by the people. If you need any further inspiration on how we can all make a difference, then I recommend a quick listen to Stake A Claim by Dan Le Sac vs. Scroobius Pip on You Tube, do it quickly though because simple pleasures like this could soon be a thing of the past.